Do you live in New York City? Planning a trip there? Then you will likely be interested in a newly-released picture book for the pre-K to kindergartner set: New York Day & Night by Aurelie Pollet and Vincent Bergier. In the endpapers we meet Sandy the cat who helps us explore the dark, starting with a rocket-ship shape that stands out light against a dark blue and black night sky. Lifting the page, Frankie the squirrel welcomes us to New York in a daytime scene which reveals the rocket is actually the iconic Empire State Building. Note: many of the buildings or locations are identified in the text, but some, like this one, are not. Overall, the book reminds me a bit of Where the Wild Things Are by Maurice Sendak, except that the scary night parts with monsters or villains are brief, ending with the turn of a page. Readers may feel alternating tension then relief in each set of spreads as they learn that sometimes things aren’t as they seem. Ironically, both author Aurelie Pollet and illustrator Vincent Bergierare from Paris and this celebration of New York was originally published in France. New York Day & Night will delight young readers familiar with the city and may inspire others to want to visit. Discover a copy today! Want to read more books set in New York City? 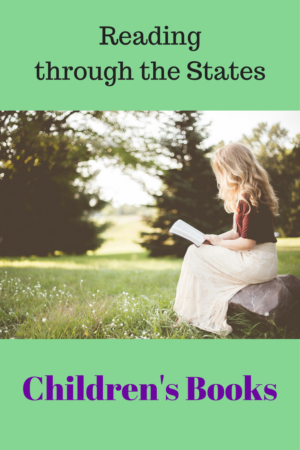 Check our list at the Reading through the States website. The book was provided courtesy of Media Masters Publicity.